31 new groups of elements! Add to your website groups of the most frequently used elements with just one click. 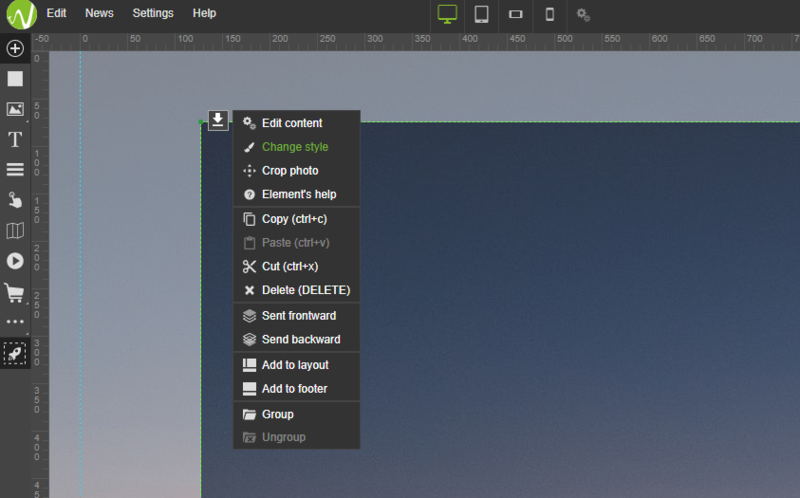 In the website builder, groups of elements are under rocket icon in the toolbar on the left side of the screen. 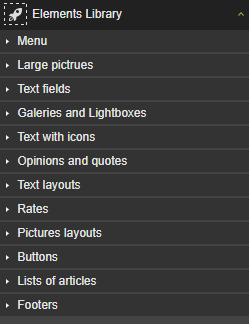 After selecting the rocket icon, you will see all groups categories. Every category rolls out, allowing you to easily look through elements in the category you are interested in. After looking through all categories, select the one you need. Drag and drop element to the working area in the builder. You can change its' style like any other element's. PRO feature allows you to activate the size and position of elements in relative units like %, vh, and vw. 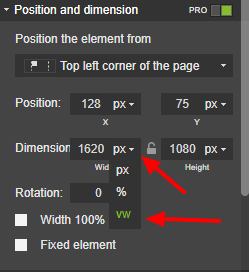 With this feature, advanced webmasters can have full control over the alignment and size of elements in regard to the size of a screen. Possibilities are almost endless, therefore we are not able to present you all of them. One of the most desired effects was adding an element on full screen in a way, it would be displayed on any screen size in the same way. Before this feature, it was difficult to achieve or sometimes even impossible with changing screen size. Elements were cropped or not visible entirely. Now it is a piece of the pie. See for yourself. We will present how to set an image on the entire screen. 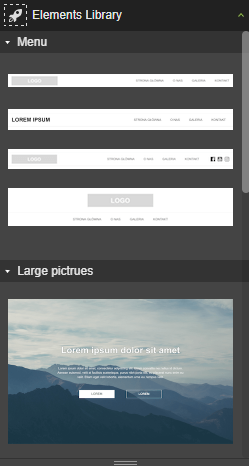 Enter the website builder and select the element you want to change and "change style". 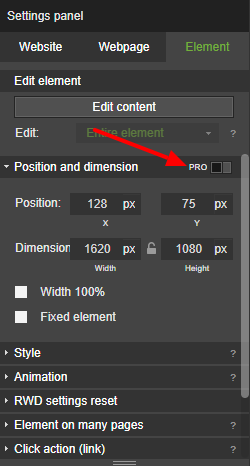 In the Settings Panel go to "Position and dimension" and activate PRO functionality. After switching to PRO, you will be able to change unit and elements alignment. We will choose VW (viewport width). 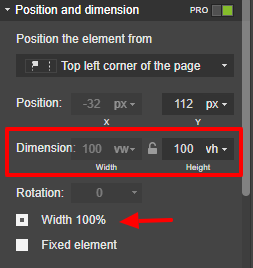 One viewport width stands for 1% of the user's visible area of a web page. Depending on screen size, the unit can have different values and displays element exactly the same for every screen size. We want our image to be always displayed on the entire screen. That's why we set width and height to 100. This way, regardless of the size of a screen website if being viewed at, the element will always look the same. It's just one of the ways this feature can be used. There are many more possibilities. See for yourself!